The goal of the Definitive design team was to create state-of-the-art loudspeakers which offered unsurpassed sophisticated technology and lifelike musical and cinematic reproduction combined in sleek and stylish designs which could be easily and attractively placed in your home. Their success in achieving these goals is immediately apparent when you listen to your favorite music or movie through Definitive speakers. The elegant slender towers seem to disappear in a huge natural soundstage which extends in a three-dimensional arc beyond the speakers from left to right, and exhibits front to back depth which, at times, can be almost startling in its ability to recreate the illusion of live music or cinematic action being performed in your room (which will seem to be almost magically expanded in size). Thousands of man-hours of critical listening and design processes utilizing the most advanced computer loudspeaker development programs available along with fundamental research at the NRC (the world's most advanced loudspeaker research facility) have combined to produce loudspeakers like no other in the world. The spectacular three-dimensional imaging, awesome deep bass response and silky smooth high definition linearity of the Definitive Technology BP6B are the result of a myriad of technological advancements and breakthroughs (including the latest state-of-the-art components and technology developed for Definitive's flagship BP7000 Series loudspeakers) which have been combined to create unmatched instruments for the reproduction of music or movies in your home. They truly recreate reality that totally suspends disbelief. Many experts and in-the-know listeners agree that bipolar speakers are absolutely superior for both music and home theater. Each speaker incorporates two complete sets of drivers, one facing forward and the other facing to the rear. Thus Definitives speakers radiate the full sonic spectrum both forward and rearward in an omni-directional pattern, exactly as sound is produced in real life. The sonic benefits you hear are dramatic! This unique technology provides you with a lifelike balance of early-arrival sound information, which provides focus, clarity and location data, and properly delayed late-arrival information, which conveys the lush three-dimensional soundstage of a live music or cinematic performance. This combination creates a huge soundfield which is rich, warm, ultra clear and vibrantly alive. Bipolar technology assures a superb panorama of lifelike sound for every listener wherever they are in the room. Most importantly, however, Definitive's bipolar speakers make the walls of your room seem to disappear and, in effect, expand the size of your room into the sound space of the recoded event your system is reproducing. They will literally bring your music and movies to life in your home. One listen and you can never go back to conventional speakers again! Movies and music are reproduced with unequaled purity, transparency and lifelike realism. 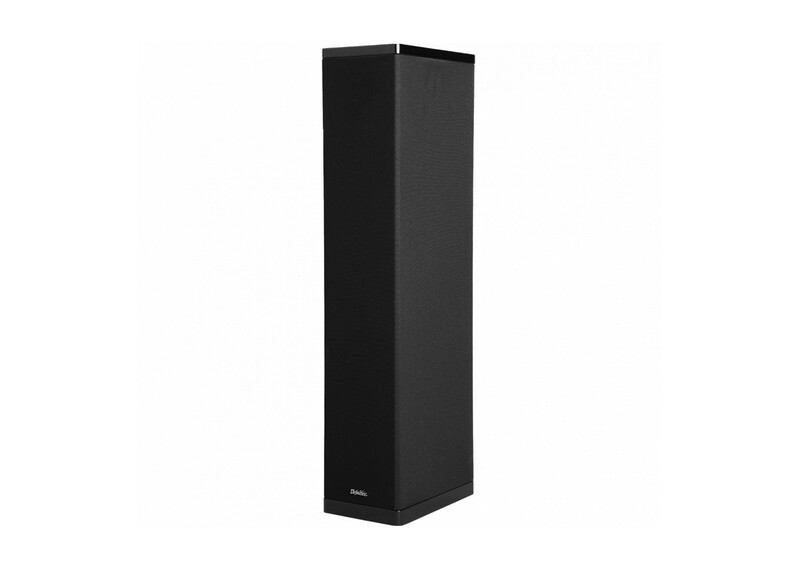 These elegant, slender towers seem to disappear in a huge natural soundstage which extends in a three-dimensional arc beyond the speakers with front to back depth which can be almost magical in its ability to recreate the illusion of live music or cinematic action actually being performed in your room. This combination of high resolution, magnificent sound-staging awesome bass and explosive impact literally envelops you in what is absolutely the ultimate listening experience. The cabinet of a loudspeaker plays a large part in its sonic performance. Diffraction, or the secondary radiation of sound caused by cabinet edges, grille frames and other protrusions, can color the sound of a loudspeaker. The design of the BP6B reduces diffraction to an absolute minimum by flush mounting drivers on extremely narrow baffles with radial edges, which are covered by a frameless grille "sock." In addition, the resonant vibration of a loudspeaker's cabinet walls and baffles can also impart unwanted coloration. The Definitives' monocoque cabinets are constructed of high-density medite with 1" thick front and rear baffles, foam dampening pads and internal braces. This virtually eliminates resonant cabinet coloration which could otherwise interfere with the pure sound produced by our high definition drivers. The BP6B also includes an additional divider/brace panel separating the front and rear drivers.